Giving a new kitten a home will bring you rewards and special responsibility. We would like to take the opportunity to welcome you and your new arrival to My Pets Vets. We hope we can help you every step of the way and provide you with all the knowledge you need to keep your kitten happy and healthy! •	Introduce him/her to new rooms one by one. •	Provide him/her with somewhere to rest somewhere quiet. •	A few simple toys to play with, and a scratching post. •	Your kitten will need 3 to 4 small meals a day following the feeding guidelines on your chosen food. •	We can advise on choosing a good quality complete food. •	If you want to change their food, wait until they are settled with you, then gradually mix the new food with the current food increasing it daily for a week. •	Always remember to clean and rinse your kitten’s bowls daily. •	Nutritious treats can be given occasionally. •	Do NOT give your kitten cow milk, as it contains lactose which can upset your kitten’s stomach. •	Introduce your kitten to its litter tray, place them in it, and stroke its paw on the litter. •	Never move the litter tray, it should stay in the same quiet location, away from food and water bowls. •	Clean the litter tray as soon as it has been used. •	Accidents happen but it’s important not to tell your kitten off. Clean up well to remove smells so they don’t return to the same place. •	No climbing the curtains, sharpening claws on the sofa etc, and no stealing food. •	Distract from doing the above with a loud clap, noise or ‘no’. •	Praise for correct behaviour, rather than telling him/her off when they get it wrong. Kitten’s learn faster this way. •	We can vaccinate kittens from 9 weeks of age, and give a second vaccination 3 weeks. •	Booster vaccinations are required yearly to ensure your cat has the best protection possible, a complete health check will be completed at the same time. •	Regular preventative treatment against worms, fleas and other parasites is essential for your kitten’s wellbeing, along with human health. •	We advise on the most effective and the safest products available, that are best suited to your pet’s lifestyle. •	Most shop bought products are ineffective. •	We recommend monthly worming against roundworm until at least 6 months of old for your kitten. •	We offer free nurse worming checks. •	It is your responsibility, to provide suitable identification for your cat. •	Get your kitten used to wearing a safety collar with a name tag, including your name and address, and ideally our telephone number. •	Micro chipping is the most effective way of identifying a lost or stolen pet, as long as all your contact details are kept up to date on the central data base. •	Your kitten can be micro chipped at the same time as vaccinations are given. •	It is important to introduce your new kitten to different people, children and other pets to provide them with the social skills needed through life. •	Let your kitten get familiar to new smells, sights and sounds in their own time, and ensure they can escape to another room if frightened. •	Encourage your kitten to play with light small toys, but nothing small enough to be swallowed, a rolled up ball of paper makes a good toy. •	Always supervise your kitten if its playing with a toy on string. 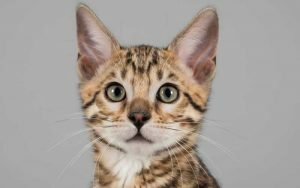 •	We encourage new kitten owners to give us a call and arrange a visit to the surgery at a convenient time, so that your kitten can experience gentle handling, along with the sights and sounds of our practice in a positive way without having any treatment. Our nurses and vets are always happy to have a cuddle with a kitten. •	Your kitten will have baby teeth until they are around 4 months old. •	We can give you tips on dental care, brushing, and available products. •	Grooming helps create a bond with you and your new kitten, and gives you a change to check its coat, eyes, ears etc. •	Long haired cats and kittens can need up to 15 mins of grooming a day. •	We can give you advise on suitable products to use. •	If you are not planning to breed from your cat we recommend you get them neutered. •	There are many behaviour and medical reasons why we recommend this and we are happy to discuss this with you. •	We can neuter kittens from 16 weeks of age if not before. •	We recommend you insure your kitten. •	You can never predict accidents or illness but being prepared is important, and provides peace of mind. •	Insurance companies will pay vets bills for the owner who will pay monthly or annual premiums. There will be an excess for you to pay. •	We advise you opt for a policy that covers your pet for life. Some policies do not cover conditions for life. Here at My Pets Vets we offer a Pet Care Plan for your new pet. This plan allows you to spread the cost of your pet’s routine health care needs over a 12-month period, whilst providing you with a substantial saving. Please do talk to our Reception team. As a responsible pet owner it’s important to provide your kitten with everything they needs throughout the course of their life. We will always answer any questions and give appropriate advice when needed throughout your cat’s life.